1. Log in with your access credentials to the Plan Sponsor Dashboard here. 2. 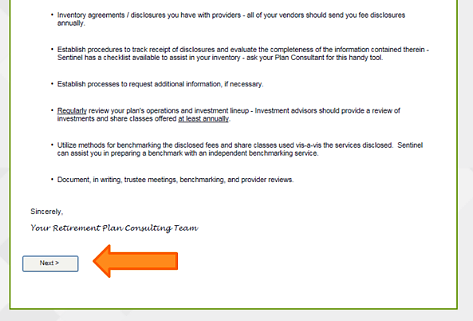 From the Plan Sponsor Dashboard, select the Annual Package tab. 3. Once selected, a new screen with the Annual Package letter will appear. 5. Please click on the Next> button in the lower left-hand corner of the page to begin completing the Annual Employer Package. You will have the opportunity to save your progress along the way, should you need to resume your input later on. 6. When all input screens are completed, you may submit your Annual Employer Package by clicking on the Submit button on the last screen-page.